As soon as the weather cooled off and the rain came in for a day, I was ready for fall! I've noticed I've been gravitating a lot more to black, grey and white fashion items: a little less colour than usual for me. Much more minimalist than usual, but I'm excited to dive in this style. I've always been a fan of black and white outfits with a red lip to match, so this will just be expanding on this! These are a few of the items that are on my radar for fall this year. 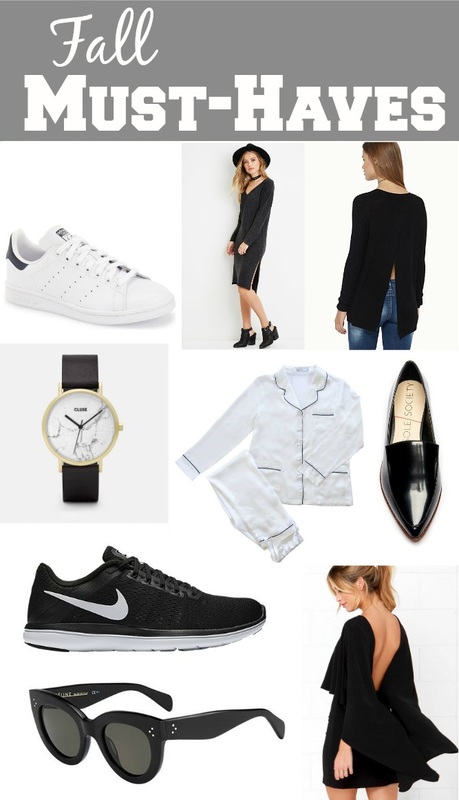 As you can see, there are quite a few pairs of shoes on my list - I have lots of boots, but I am in need of some good basic shoes, from staples like black flats, to comfortable walking shoes like these Adidas Stan Smith sneakers and Nike Flex running shoes. The running shoes are definitely a shock even to myself, as usually I would HATE the idea of wearing runners outside of gym attire, but I must say I've been pretty inspired by the street style this year. Now, more often than not, the things on my wishlist cost a lot more than I'm willing to budget for some trendy fall fashions, so stay tuned for another post once I've researched some steals vs. splurges!